In Laparoscopic hernia repair , particularly abdominal herniorrhaphy, fixation of the prosthetic mesh to the abdominal wall is commonly achieved by using tacks ( staples ) and/or trans-fascial sutures. Previous studies have shown trans-fascial suture fixation to be up to 2.5 times stronger than tacks. A correlation between fixation without sutures and hernia recurrence has been suggested .Trans-fascial suture fixation is therefore recommended in abdominal herniorrhaphy. Trans-Fascial suture fixation however requires greater skills than tack fixation and therefore can prolong procedure time. 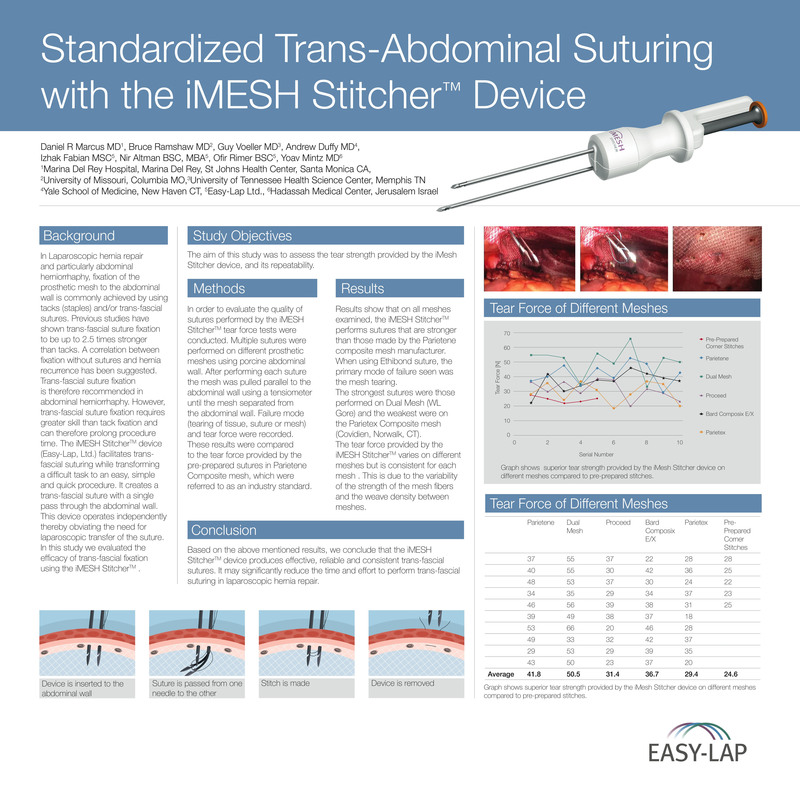 The iMesh Stitcher device ( Easy-Lap, Ltd.) facilitates trans-fascial suturing while transforming a difficult task to an easy, simple and quick procedure. It creates a trans-fascial suture with a single pass through the abdominal wall through a 2 mm skin incision. This device operates independently thereby obviating the need for laparoscopic transfer of the suture . In this study we evaluated the efficacy of trans-fascial fixation using the iMesh Stitcher. In order to evaluate the quality of sutures performed by the iMesh Stitcher , tear force tests were conducted. Multiple sutures were performed on different prosthetic meshes using porcine abdominal wall. After performing each suture the mesh was pulled parallel to the abdominal wall using a tensometer until the mesh separated from the abdominal wall. Failure mode ( tissue tears, torn suture, or torn mesh) and tear force were recorded. These results were compared to the tear force provided by the pre-prepared sutures in Parietene Composite mesh, which were referred to as industry standard. The only mode of failure that occurred was mesh tearing . The tear force provided by the iMesh Stitcher varies on different meshes but is consistent for each mesh . This is due to the variability of the strength of the mesh fibers and the weave density between meshes. Based on the above mentioned results, we conclude that the iMesh Stitcher device produces effective, reliable and consistent trans-fascial sutures . It may significantly reduce the time and effort to perform trans-fascial suturing in laparoscopic hernia repair.